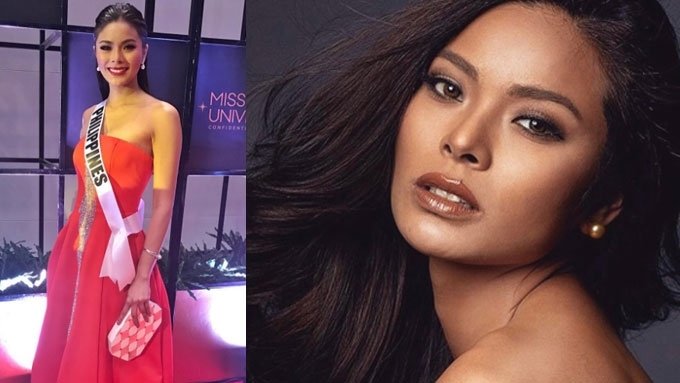 How did Maxine Medina fare in Miss Universe preliminary round? The crowd went wild with Maxine Medina's twirl during the swimsuit portion. What did Maxine Medina wear during the evening long gown competition? Did she slay the swimsuit portion? And her national costume, was it arresting? In case you missed the preliminary round held earlier tonight, January 26, at the SM Mall of Asia Arena, here's to show how the Philippine bet fared. During the swimsuit portion, Maxine walked with grace and confidence, and wowed the crowd with her twirl. The 26-year-old Pinay wanted something "strong and elegant" for her long gown. Designer Rhett Eala created this emerald fringe gown. Maxine's national costume was inspired by the Vinta boat. Its headdress had golden south sea pearls. What do you think, PEPsters? Will she make it to this year's Miss Universe Top 12?